For the self-directed learner in your life who is trying to learn code. Treehouse is an online learning platform that makes learning code easy and fun. A subscription to treehouse is $25 a month for a basic account and $49 a month for a pro account. A boring book for Christmas? Not so fast – Eats, Shoots and Leaves is an entertaining way for people of all ages to learn or reinforce fundamental grammatical rules. Truss’ diction and witty examples are ludicrous and laugh out loud fun for any young adult. It’s the type of reference book everyone should have on their shelves. 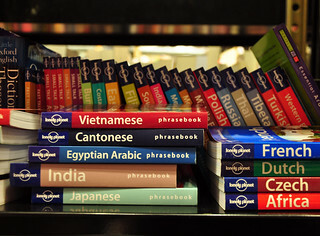 Anyone who wants or currently is learning a new language needs a phrasebook. It won’t teach all the grammatical structures needed to master a language, but it will help boost vocabulary. A pocket-sized phrasebook costs around $10 and is especially handy while on the road. CreativeLive is a live, interactive classroom perfect for creative self-directed learners. They feature courses taught by world-renown artists and entrepreneurs on topics such as photography, music production, creative entrepreneurship and even cake decorating! If you know a self-directed learner interested in honing their creative skills, introduce them to CreativeLive. All self-directed learners know the importance of efficiency. Getting Things Done, is a roadmap to stress-free organization and performance that anyone from a CEO to a young student can use. Allen's premise is simple: productivity is directly proportional to our ability to relax and our minds are meant for creating ideas, not storing them. When our minds are clear and our thoughts are organized, there’s nothing we can’t achieve. Self-directed learners should network just as much as any businessman. To do that, give them a set of business cards with a witty title. It will make them feel professional in their quest to learn more and better themselves. What makes Udemy different is that its courses focus on learning real-world skills. These are for the self-directed learner who wants to learn something they can put into practice and benefit from right away. Some courses on Udemy are free, but for the money-conscious learner, you can get them one of the courses that they have interest in, but don’t want to front the cost for. The price of Udemy courses range from a dollar to several hundred dollars. If you know someone who is ready to make the leap and drop out of school, there’s no better resource than Dale Stephen’s Hacking Your Education. Dale explains to readers that they do not need to be a genius or especially motivated to succeed outside school. The real requirements are much simpler: curiosity, confidence, and grit. You can find it on amazon for $12.